I'm honored to be of service in offering this light filled channeled message from Archangel Metatron set to the beautiful music of Thaddeus. This message has also been transribed for you below if you would prefer to read it… Just keep scrolling down. Greetings beautiful beloved being of light, indeed, I am here. I am Archangel Metatron. It is my honor to connect with you now. I invite you to fully enter in to this moment, to release all thoughts, and to enter within now, opening your heart, opening your message center by which you are able to connect with and experience the Divine. Open, focus within and tune in to your feelings, to your imagination, and to your heart. Know that you are, indeed, surrounded with light, and you are being sent frequency of unconditional love, of light, to assist you in raising your vibration. 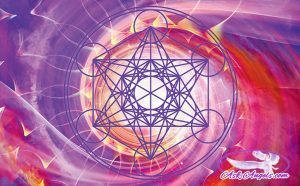 And allow this light into your presence and into your energy through your crown chakra at the top of your head, the geometrical golden cue of light above your head. And as you allow this light into your light body, your physical body, your emotional body, you are being cleansed of all that is not love, of the energies of darkness, of doubt, despair, of ego, dissolved into the light. This energy, this frequency is compassion, it is love. And feel it flowing throughout your veins, from your fingers to your toes, down your spinal column. You are, indeed, filled with the energy of the higher realms, the energy of love flowing in, still through your crown, cleansing your system. The benefit of this is your vibration is increasing. The more you are able to relax now, dropping in deeper and deeper into your heart, knowing that you are okay, losing touch of your reality, of who you are, and perhaps, what you are intending to accomplish. For now, release all thought, all identification of who you are and what you believe you can be. Your belief systems very much create your reality. And so, when you allow yourself to simply be open, you are able to align with this unlimited possibility for your life by raising your vibration, allowing light to flow in and through you, which will greatly accelerate your growth spiritually and financially. The more light you are able to hold, the more closely connected you are to the Divine at all times. And beloved one, during this transitional period, before humanity as a whole takes a great leap, there is enormous opportunity for you to commune and connect with the Divine always. This connection is made possible through your gratitude for all that you have and all you are blessed with, and through your obedience in following a spiritual path. Obedience need not be a negative term. But instead, associate this now with being obedient to your highest path, staying connected to your heart and to the Divine so that you know the right course of action to take at any time. Your loyalty is being willing to take action when you receive a message from the spirit, allowing this to flow through you. Unlimited possibility is yours as you raise your level of vibration more and more. I am assisting you with this now. But know that you are able to do this on your own also. And it is of the utmost importance to the point that the astrological influences of the now, and of the month to come, support you in this inward focus, contemplation and connection. You, of course, have free will. And choose you to ignore your inward self, focusing rather on the exterior, you will be greatly missing out. For on the inner planes now, evolutionary tools exist to help you, to even show you how to activate your DNA to the highest and best possible extent, to open your spiritual channels for communication. These you have, and you are able to connect with your angels, with master guides, with spiritual beings, even your ancestors. And I tell you now, you do this from within by opening your heart, your message center, and then carefully choosing your thoughts and your intentions—a powerful tool for any manifestation in regards to communication. Open your heart and intent. “Hello angels. Thank you for your presence. How can I align more closely with my highest possible path?” Once the question has been asked, focus on your heart, open your heart even more, and in the next minutes, seconds to follow, pay attention. What thoughts enter your mind? What images do you see with your mind’s eye? How do you feel? Tune in through your heart, set a focus with your intention, and then be open to the unlimited possibility, and indeed, the direct connection with the Divine that is a gift and is oh, so possible for you. As you raise your vibration, the accuracy of the messages you bring through will increase, the accuracy of knowing your path and knowing the guidance of your soul, your angels and your higher self will increase. Tune in, open your heart, open your crown, surround yourself with light, and take full advantage of the energies present now. Remember that challenges in your life offer you opportunities for growth. And so, instead of feeling sorry for yourself and turning a challenge into a downward spiral when a difficult challenge enters your life, choose to learn from it, to see it as a blessing, to be thankful and gracious for the challenges you are experiencing. When you are able to do this, and it is easier when your vibration is increased, your challenges then have the opportunity to mold, and to transform themselves into blessings. So remember, when a challenge is identified, give thanks and ask what is the lesson needed to be learned. You are presented with challenges so that you may rise above limiting patterns and beliefs. You are ready to fully open to your power and to the light. You are supported at this time in this, but it does take your awareness, focus and commitment to daily quiet your mind, open your heart and connect with the Divine, with the frequency of unconditional love, compassion, light and peace. Allowing Divine presence and increased light into your life will bring you blessings in many forms. Raising your vibration through this direct connection is the quickest way to significant transformation. Daily connect, raise your frequency, and of course, choose to share the love that you receive with all and in every moment. You are so deeply, deeply loved and supported. Remember to tune in to the angelic guidance around, to ask for assistance, and to open your heart. I am Archangel Metatron. You are deeply, deeply loved. Really wonderful message to increase the vibration and to connect with devine realms. God bless you ever for this guidence to the humanity .